Columbus Crew goalkeeper Andy Gruenebaum distributes the ball in the game against the New England Revolution at Crew Stadium. The New England Revolution win 1-0 Columbus Crew. COLUMBUS – The Columbus Crew announced today that it has traded goalkeeper Andy Gruenebaum to Sporting Kansas City in exchange for a Second Round 2016 MLS SuperDraft selection. Per Major League Soccer and club policy, further terms of the transaction were not disclosed. Gruenebaum played the last eight seasons with the Crew, posting a 26-31-21 record and a 1.29 goals against average mark to accompany his 18 shutouts. Gruenebaum served as the primary back-up for his first six seasons and was a part of the club that won back-to-back Supporters’ Shields in 2008 and 2009, including the club’s 2008 MLS Cup victory. The Overland Park, Kansas native saw the majority of his action in his final two campaigns with the Black & Gold, becoming the starting goalkeeper in 2012 and making 54 of his 80 total starts in Columbus over the course of 2012 and 2013. 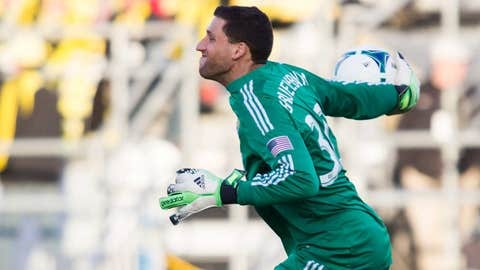 The 30-year-old netminder departs the Crew in the top five in several of the club’s all-time goalkeeping categories. Gruenebaum is third in regular-season games played (80), starts (79), minutes played (7,065), goals against average (1.29) and shutouts (18); and was fourth in wins (26) and saves (270). He recorded an MLS-best 124 saves in 2012 and was a finalist for MLS Goalkeeper of the Year. Acquired with the third overall pick in the 2006 MLS Supplemental Draft, Gruenebaum was an All-American as a senior at Blue Valley North High School in Kansas and was the NSCAA Kansas Player of the Year in 2000. TRANSACTION: Crew trades goalkeeper Andy Gruenebaum to Sporting Kansas City in exchange for a Second Round 2016 MLS SuperDraft selection.